I would like to thank my hosts the UKTI and the CBBC for this opportunity to talk with leaders of small and medium-sized businesses in the UK. Many British friends told me that one of the distinctive features of the UK economy is the large number of SMEs, which account for 99.9% of all businesses here and over half of UK’s GDP and jobs. 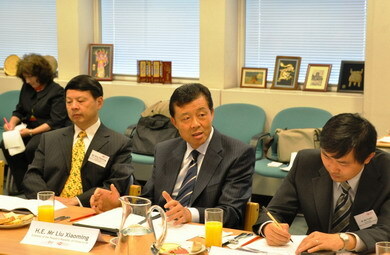 Your introduction has impressed upon me the unique strengths of British SMEs and your successful stories in China. British SMEs are known for their productivity and advanced technology. They are generally well-run and enjoy strong support from government and chambers of business. Equally importantly, SMEs here have shown a strong interest in cooperating with Chinese partners. The well-known British economist Mr Schumacher once said, “Small is beautiful”. I am happy to say that SMEs likewise play a prominent role in China. Over 40 million Chinese SMEs account for more than 99% of the total number of companies in China. They contribute to over half of GDP growth, nearly 70% of trade and about 80% of all urban job creation. 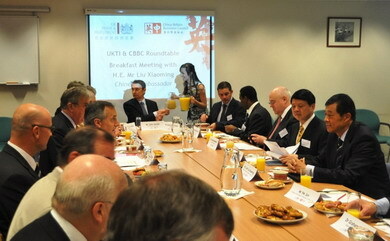 Sustained economic growth and huge demand of China offer UK SMEs enormous business opportunities. China’s GDP grew 11.9% and its imports 64.6% in the first quarter of this year, setting a new record. China is emerging as the largest consumer in the world. A survey by UNCTAD on hundreds of multinational companies shows that China remains the most attractive destination for foreign investment in 2010. Both China and UK share strong interest in strengthening economic and financial cooperation and promoting common prosperity. Though still at an early stage, SME cooperation holds great promise and is expected to be a key area in our overall business cooperation. Firstly, we need to view SME cooperation as an important part of our comprehensive strategic partnership, and incorporate it into key bilateral mechanisms such as the Economic and Financial Dialogue and the Joint Economic and Trade Commission Sessions. Secondly, we need to provide a platform for SMEs of the two countries through exploring the possibility of regular exchange mechanisms such as the SMEs summit. Thirdly, we need to urge government departments and business councils to interact more and share information and best practice. Fourthly, we need to identify areas for cooperation and draw on each other’s strength. We should make full use of UK’s strength in the service sector and high-tech and China’s strength in manufacturing to increase market share in each other’s countries and globally. I look forward to learning more about your expertise and vision, and I am ready to assist you wherever necessary. I wish you every success in your operations in China.